This is a custom trip prepared for avid hikers who wish to explore as many mountain trails as possible in a 10 -12 day trip. We will design the hikes depending on conditions, fitness level and interests of the participants. Each day is spent exploring and doing fun activities with monks and villagers, school kids and old folks. This is one of the prettiest valleys in the Thimphu area, with abundant bird life. The long hike to Jomkerim Pass (4300m) leads through pristine forests and offers great views of the surrounding valleys. If you keep going you will reach Yangtse Tsho (lake). Starting point-- Pass through Dechhenchho’ling and follow the main road up to Dechhenphu lhakhang. Dorjidra goenpa (7.5 km return, 490 m up, 3 hrs) or also Dui goenpa (10 km return, 850 m up, 4-5 hrs). Nice hike from the road near 4th King's palace to a village inhabited by monks. 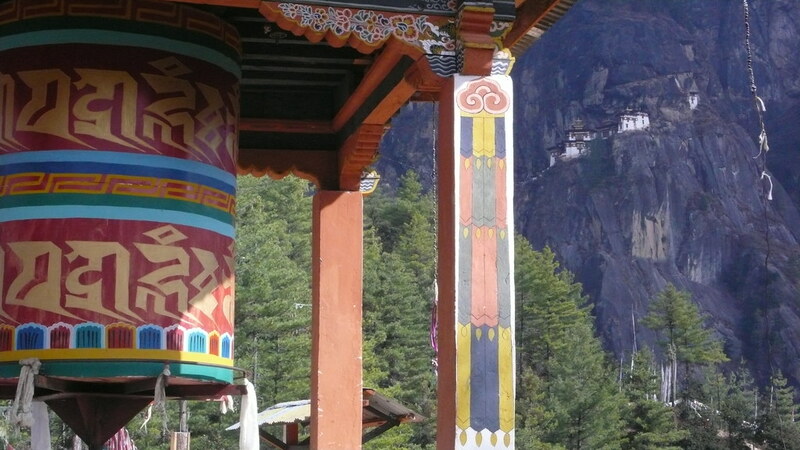 Just past the main monastery there is a beautiful temple, built below a colourfully painted overhanging rock. 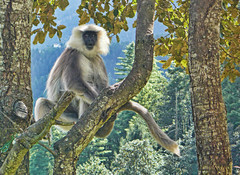 Grey langurs can be sighted in the trees/on the rocks above the village. The monastery guest house can be used to stay overnight here, attend classes and prayers with the monks, eat dinner at their canteen and help teach English class also. Phajodhing gompa, Thujedrag gompa, Ridge above Thujedrag and Pumola, back to Takin reserve. Phajodhing is one of the most popular hiking destinations around Thimphu because of its commanding location above the valley. Great views when it is clear from 12000 - 14000ft high. Traverse of the ridge from Telecom tower, Chhokhortse gompa to Phajodhing to Thaptsa peak via Pumola and down to Buddha point (19 km one way, 1550 m up, 8-10 hrs, strenuous). Nice hike to Gida valley, trail meets a rough forest road where the valley opens up at the houses, and you get a view up the valley with more farmhouses and some fields (Tshelung nang village). High up on the ridge straight ahead stands Jili Dzong above Paro. Car will meet us here and take us to the hidden valley of Tselung Nye where Guru Rimpoche rested and left some interesting artifacts in the rocks. 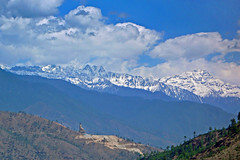 The peak is directly above the main town of Thimphu and gives clear views to the north and west. Lungchuzekha goenpa is one of the best destinations around Thimphu: beautiful forest, and a spectacular view from the goenpa. The loop to Trashigang is easy and pretty. You can even get an earlier start (and better views) if you spend the night in the hotel just near Dochula pass. Can also include HingeyLa pass for extra hiking, and explore the ridge and temple above DochuLa in the rhododendron forests. Talakha goenpa to Talakha peak (17 km return, 1350 m up, 7-8 hrs). 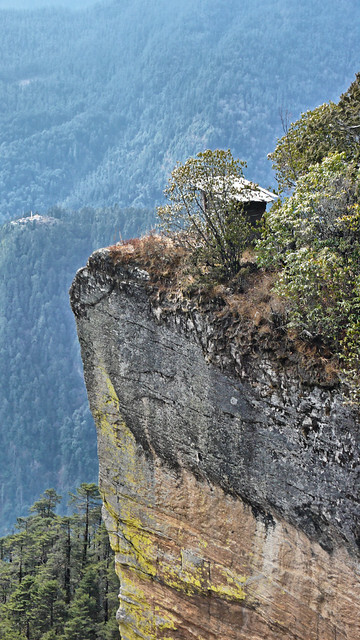 The trail to Talakha goenpa is hot on sunny days, but the views from the goenpa are excellent. 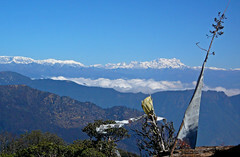 Hikers who reach the peak on a clear day are rewarded by the best mountain views in the entire Thimphu area; virtually all mountains between eastern Nepal and central Bhutan can be seen from here. Talakha peak itself is at 4,278 m. You can see most of Northwestern Bhutan from this spot. Straight ahead the rounded cone of Jhomolhari, Bhutan’s most sacred mountain (7314 m), the sharp pinnacle of Jichhu Drake (6989 m), and Tserem Kang (7000 m) guard Bhutan’s northern border. 150 km to the west, on the Sikkim-Nepal border, massive Kanchenjunga (8598 m) towers over the lower mountains of Paro and Ha. Further to the east the high Himalayas of Lunana and the Black Mountains dominate the skyline. Droley gompa and Sinchula pass. Starting near Dodena a short hike to the gompa with views above Kabesa. Then continue over a high ridge, yakherder camps to the pass which is an old route to the Punakha valley. Return via steep trails to Kabesa village, where a private Art school is located. 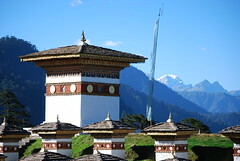 Dongka lhakhang and Bemri lhakhang - at about 3700 m with views of Paro and Thimphu. This can be reached easily by 4x4 vehicle and walk from Shaba village in the Paro valley, after visiting Drakarpo. 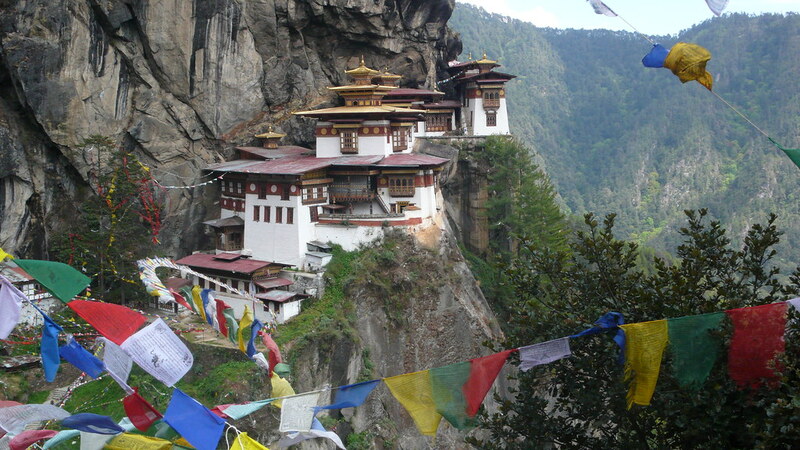 Drakarpo monastery on a cliff where you find caves, footprints, where Guru Rimpoche meditated in the 8th century. A short drive above the Paro valley and a walk up and around a cliff, the holy cave and a temple, visiting the interesting places and views of the area. On the way down we also see Eutok gompa which was restored recently to fix earthquake damage. It houses many relics of the founders of this place and has a young new principal lama who is keen to show visitors the refurbished monastery. A drive to Chele La Pass which, at 3,988m, is the highest road pass in Bhutan, snaking upwards through blue pine and rhododendron forests for 35 kilometers. On a clear day the view sweeps away to the snow-dome of Bhutan’s second highest peak, Mt Jomolhari (7314m), and down to the Haa Valley. The Haa valley has a simple traditional life with yak pastures over the open ridges leading to Tibet. 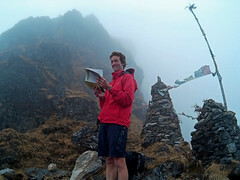 Hiking along the ridge, we pass a sky burial site (4200 m). Descend for an easy hike through rhododendron forest to Kila Gompa (3500 m), an ancient nunnery nestled in a craggy patch on the mountainside. Kila Gompa is historically significant as a sacred meditation site. Many renowned Buddhist saints have come here to find peace and seclusion. There are 7 temples and retreat huts housing 30 - 70 nuns. Hike back to the road and drive down to Paro, with side trip to a village, and another small temple built on a cliff overlooking rice paddies. (4 - 5 hr hikes and several hours drive). The hike to Chumphu Nye starts from the upper Dop Shari Valley after a drive for about half an hour on the dirt road from Paro till its end. Then keep walking along the river till you get to a place where there is a small chorten (stupa). You see Chumphu Nye above you atop a hill on your left. Hiking time 4 - 6 hours to visit the small pond and waterfall above the temple, and do a loop down the cliffs to visit caves and a large waterfall. According to Lama Namgay - The statue inside is not resting on anything. It is floating in the air. That is because the statue is not man-made. It is Dorji Phamo who appeared in person and turned herself to a statue. Also, anything you wish for, here, will come true. SangChoekor monastery high above the Paro valley. Several temples and a monastic school are found here, so we can visit and hike to Rinpun gompa and others to about 10000ft (3000m) above sea level. 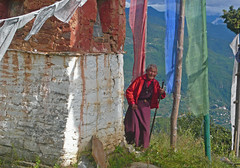 Hike from SangChoekor Buddhist College to Yak pasture below Bumdra Monastery (3,800 m). 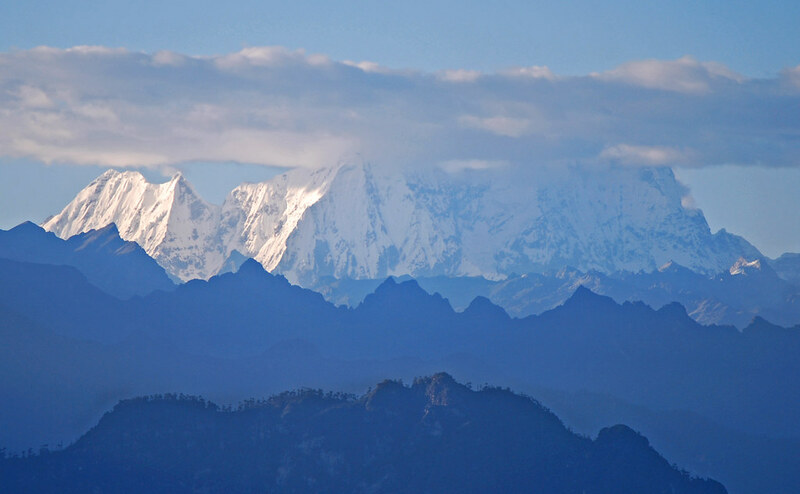 Hike takes you up into fresh mountain meadows with views of the snowy Himalayan mountains. Paro Taktsang (Tiger's Nest) - monastery is located 10 km to the north of Paro and hangs on a precipitous cliff at 3,120 m on the right side of the Paro Chu. The rock slopes are very steep and the monastery buildings are built into the rock face. Though it looks formidable, the monastery complex has access from several directions, such as the northwest path through the forest, from the south along the path used by devotees, and from the north (access over the rocky plateau, which is called the 100,000 Fairies) known as Bumda. The track leading to it passes through pine forest that is colorfully festooned with moss and prayer flags. On many days, clouds shroud the monastery and give an eerie feeling of remoteness. There is enough hiking here for 12 days and as much as 10,000 meters of climbing in total. All the peaks and passes are 3700 m to 4300 m range. Additional days can be spent in the Haa valley or Punakha valley for more hikes, hot springs, holy lakes and caves and sacred sites. We can easily choose a set of 10 hikes to cover 10 days visiting the most interesting places, and vary the itinerary according to weather and trail conditions, as well as optimum photography of flowers, birds, monkeys and Himalayan views. Hotels would include overnights in Thimphu, Paro and possibly at DochuLa. 3 star accommodation would include: Gangtey Palace, Tenzinling Resort, Peaceful Resort, Yeedzin guest house, Khamsum Inn, Dochula resort, or others similar.